I went back and corrected some typos in earlier posts and edited the first post to include links to the Yahoo Group where the amplifier is discussed and supported. Now, back to the workbench! I've made a little more progress on the amplifier. About 10 more capacitors were added before my eyes got tired. I quit before messing anything up. I got an email asking about using "surface mount" components. There are lots of articles about this technology on the web. 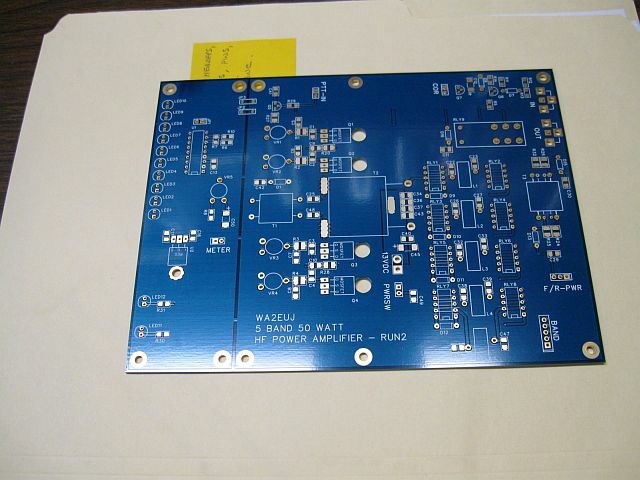 This one, What is SMT Surface Mount Technology from Radio-Electronics is a good beginning if you are unfamiliar with it. The smallest SMT parts used in the WA2EUJ Amplifier are what's called an "1206" package. This designation means that the part is 0.12 inches long and 0.06 inches wide. That seems tiny but other common, but even smaller sizes are 0805, 0603, 0402, and 0201! Realistically, while using anything is possible I suppose, I think the 0805 is the smallest most hobbyists would easily deal with. The 1206 is definitely more "middle aged eye friendly." There are techniques for hobbyists to use old electric skillets, hot plates, and toaster ovens along with something called 'solder paste' to mount SMT parts. I chose to use a traditional soldering iron and hand solder my board. I don't build a lot of projects that use SMT parts and I didn't want to gear up to do lots of SMT work for this one item. 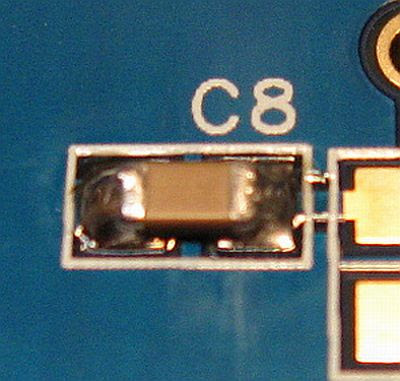 Below is a photo of one component that's been hand soldered onto the board. It probably has a bit more solder than is necessary but frankly the soldering wasn't so ugly that I'd be embarrassed to share the photo! First I tin the pads on the PCB with a tiny amount of solder. Next I use a piece of solder wick or a 'solder sucker' to remove the solder from the pads leaving a thin smooth layer. While holding the part down with the tip of the tweezers touch the soldering iron to one end of the part and the solder pad at the same time to re-flow the solder. Go back and add a small amount of solder to each component lead so you have a good electrical and mechanical joint. This sounds tedious but it really goes pretty quickly once you get into it. Be careful!!! If you drop one of these parts or squeeze it too tight with the tweezers you can easily launch it across the room. 0.08" and 0.05"? It's practically a waste of time looking for it unless your shop is a whole lot cleaner and less cluttered than mine. That's it. Easy as pie if you take your time. I recommend using one of those magnifiers with a headband while you do this work. In general you should always wear eye protection when soldering. A blob of molten solder in your eye would really take the fun out of a project. Okay, the camera problems are resolved. Here are some initial photos to give an idea of the project. 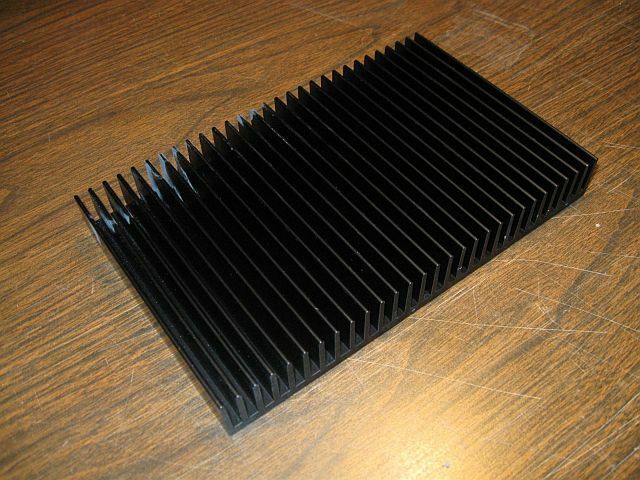 This heatsink is probably overkill for a 50W amplifier but the designer and most of the other builders have used it successfully. Can an amplifier be too cool? 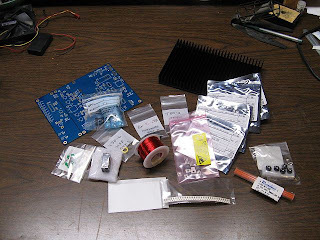 Finally, here's a sampling of the parts that will be added. Not shown here I have actually started soldering the surface mount capacitors. More on that later. The heatsink arrived so I can take some real measurements for mounting, etc. and I've started slowly attaching surface mount parts to the printed circuit board. I'm taking pictures along the way however my digital camera has decided to not want to let me have them via the USB port. As soon as I fix that problem or come up with a card reader I'll post some "in progress" photos.